1989 John Deere 648D Dual Arch Grapple Skidder. This equipment has the bigger re-powered John Deere engine, runs and starts good, strong hydraulics and cylinders. Winch available. Power Shift transmission, axles and cradle are in good order, tight center section, arch and grapple are in good working condition. Has a wider trail blade, 30.5x32 tires @ 30%, heated cab, and lights. Contact Erik @ Red Pine Equipment 218-720-0933. Machine is located in Northcentral USA. 1989 John Deere 640D Cable Skidder. 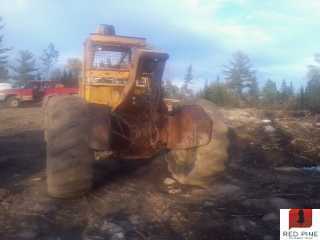 This skidder has a rebuilt engine, new turbo and hydraulic pump. Rear end has been rebuilt, cradles and axles are solid, strong hydraulics and cylinders, tight center section, 4000 winch in good working order, 5/8 swedge, 23.1 x 26 tires @ 40% with one set of ice chains. Contact Erik @ Red Pine Equipment 218-720-0933. Machine is located in Northeast USA. 1988-89 John Deere 740D Cable Skidder. This machine runs and starts good, strong hydraulics, rebuilt Power Shift transmission and control valve, tight center section, strong steer and blade cylinders, winch is in good working order, 5/8 wedge cable 150', 30.5 x 32 tires @ 30%, tilt blade. Contact Erik @ Red Pine Equipment 218-720-0933. Machine is located in Northeast USA.